NB-IoT(Narrow Band-Internet of Things) technology is a new IoT technical branch and supports cellular data network connection of low power consumption device in WAN (Wide Area Network), which also called as LPWAN. NB-IoT operates in authorized frequency spectrum. It can be directly deployed to GSM, UMTS, LTE without any interference of current networks, while the bandwidth consumption is just about 180KHz. 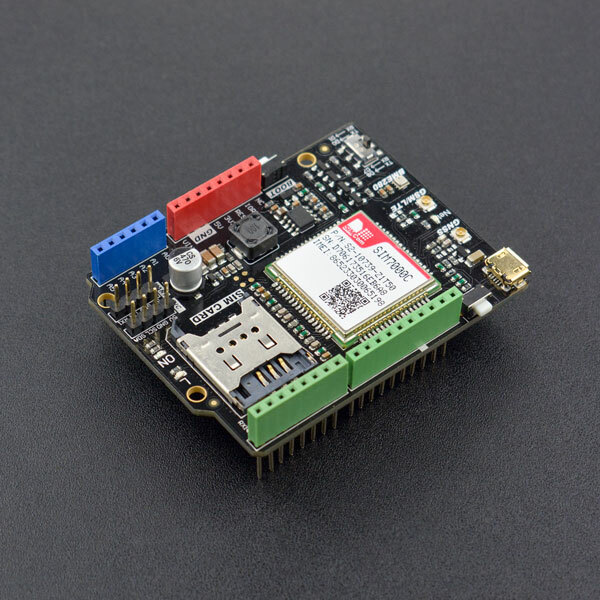 This SIM7000 Arduino NB-IoT/LTE/GPRS expansion shield is a wireless communication module produced by DFRobot and the design is based on SIMCom SIM7000 chip. This wireless communication module is designed for Arduino controllers, supporting multi-frequency LTE-FDD communication, dual-frequency GPRS/EDGE communication, NB-IoT communication. No matter prototype developments or small-batch productions, SIM7000 Arduino NB-IoT/LTE/GPRS expansion shield is the best solution to applications of low power consumption, low latency and meddle-throughput. Besides onboard GNSS (Global Navigation Satellite System), SIM7000 supports American GPS, Russian GLONASS, European Galileo, Japanese QZSS and Chinese BeiDou Navigation Satellite System. It can be widely applied to IoT applications such as long distance control, moving tracking, long distance data uploading and shared bikes. 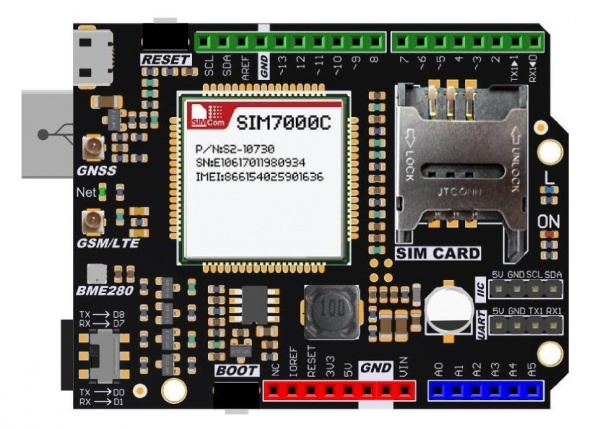 The SIM7000 Arduino NB-IoT/LTE/GPRS expansion shield supports both SIM card and NB-IoT card synchronously. You can plug in a common SIM card to achieve traditional GSM applications, such as make a phone call and send message. You can also plug in a NB-IoT card to realize NB-IoT data transmission. Besides, this expansion shield provides a BME280 environmental sensor. So it could be a prototype to develop NB-IoT projects, monitoring temperature, humidity and pressure. NOTE: SIM7000C is common used with Chinese frequency band; SIM7000E is common used with European frequency band, please carefully check your Mobile Operator statement, and select the corresponding products. Support SIM card and NB-IoT card (NOTE: Please ensure the SIM frequency range been used is included in the frequency range it supported). Software/Hardware Serial Port Switch: Arduino UNO/Mega controllers connect USB with the hardware interface D0,D1 in default. So serial port conflicts are common when serial ports are used by the expansion shields. 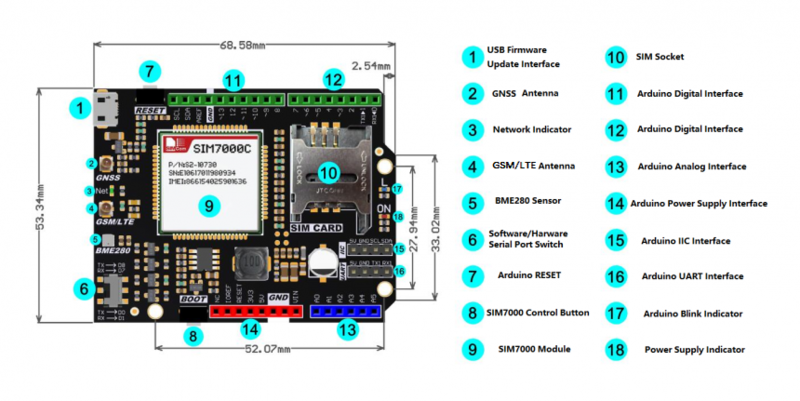 Considering these conflicts, SIM7000 Arduino NB-IoT/LTE/GPRS expansion shield equipped with a software serial port to communicate with Arduino. Learn more about Arduino SoftwareSerial Library. Boot button connected to D12 in default to control program conveniently. You can pull up D12 for 2s to ON/OFF. SIM7000 ON will initialize to get ready to work in about 2s. Please click to download NB-IoT SIM7000 Shield Library. How to install Libraries in Arduino IDE. Plug the SIM7000 Arduino NB-IoT/LTE/GPRS Expansion Shield to DFRduino UNO R3 directly. Since Arduino UNO only has one hardware port, which will make a conflict with the other Serial device, DFRobot_SIM7000 Library will use SoftwareSerial as communication port. Please turn the switch to the terminal "Tx>D8; Rx > D7". The program uses SIM7000 to achieve HTTP message interaction. Set software serial port. SIM7000 uses the software serial port to control TX to D8, RX to D7. Turn ON SIM7000 in a software way then Net indicator will blink. SIM7000 will initialize for about 2s. The function back to true when initialized successfully. Turn OFF SIM7000 in a software way then Net indicator will go out. Set baud rate of software serial port, SIM7000 serial port recognize 115200 baud rate in default. So we need to reset the baud rate to 19200 and below to avoid garbled. The function back to true when initialized successfully (other qualified baud rates are 9600, 4800, 2400, 1200). 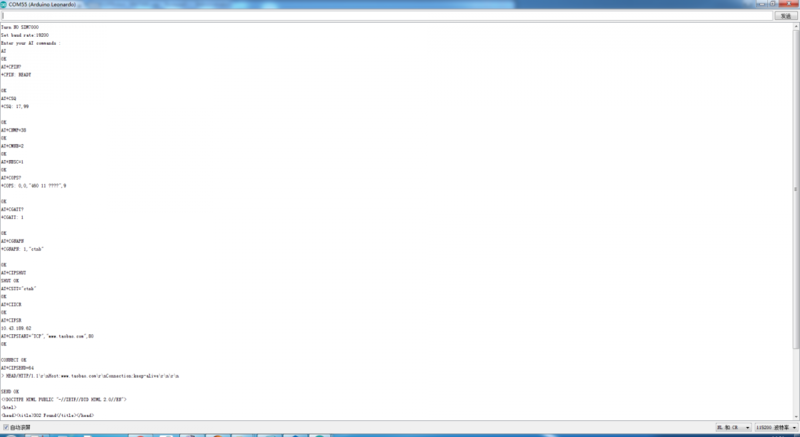 Initialize AT commands and the function back to true when initialized successfully. Check signal strengths, the return value is the signal strength. Return=99 means no signal can be detected. Start a connection service and the function back to true when connected successfully. Connect to network: select a connection protocol (TCP/UDP), domain name, port ID. The function back to true when initialized successfully. Data transmission: send data to the server when connected. Data size can be specified or inputted directly. Receive data: receive and save data from the server. The maximum data to receive and waiting time can be set. The result is the character value been received. Disconnect and the function back to true. Same as SIM7000 library, please refers to the tutorial mentioned before. Connect to an active antenna and use it outdoors. Initialize the position function. The function back to true when initialized successfully. Get current position and the function back to true when initialized successfully. Get current longitude: the east one is a positive number and a west longitude is a negative number (-180,180). Get current latitude: the east one is a positive number and a west longitude is a negative number (-90, 90). SIM7000 equipped with a BME280 environmental sensor, which recognize IIC connection in default. 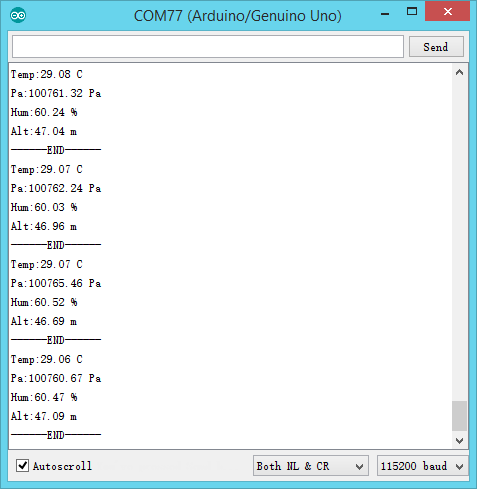 Please click to download the Arduino library file first before using. 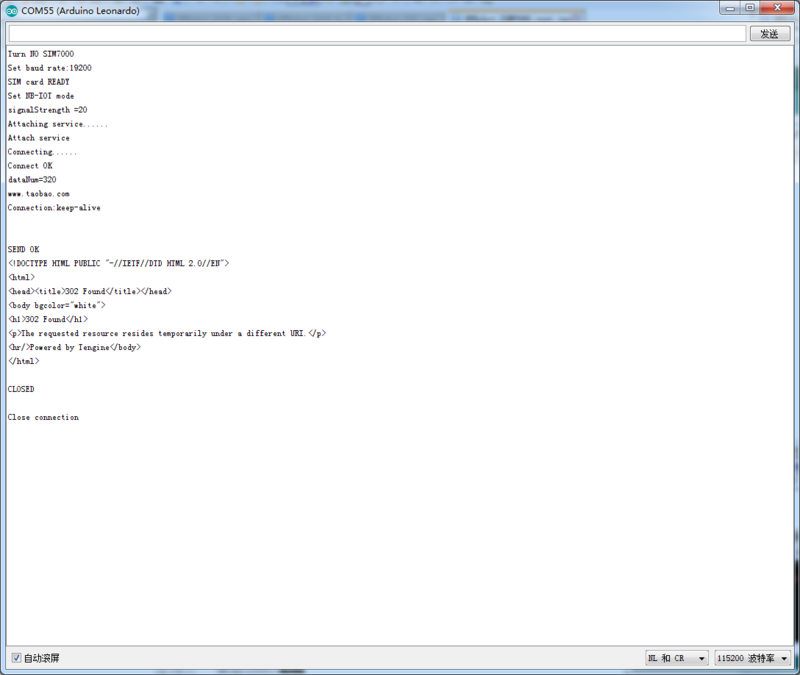 NOTE: DFRobot_BME280 bme // IIC sentence mentioned in the sample code is to initialize IIC drive. Get SIM7000C Arduino NB-IoT/LTE/GPRS Expansion Shield SKU: DFR0505 from DFRobot Store or DFRobot Distributor. Get SIM7000E Arduino NB-IoT/LTE/GPRS Expansion Shield SKU: DFR0572 from DFRobot Store or DFRobot Distributor.